Attention Residential Developers! Outstanding opportunity in Norristown Borough situated at Jervis Alley and West Wood Street just off of Harding Blvd. THE property of DJV Land Development LLC is now being offered for sale under and subject to the following conditions and stipulations. 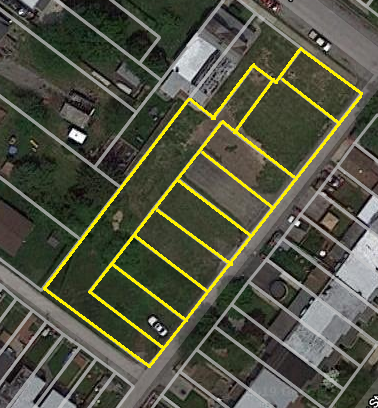 SAID property to be sold is 1211, 1213, 1215, 1217, 1219 1221 Jervis Alley each including 0.04 acres or 1,944 sq. ft. more or less and 1225 Jervis Alley including 0.07 acres or 3,161 sq. ft. more or less in the Borough of Norristown, County of Montgomery, in the Commonwealth of Pennsylvania with all buildings and improvements and known as tax parcel #’s 13-00-39592-013, 13-00-39592-022, 13-00-39592-031, 13-00-39592-009, 13-00-39592-018, 13-00-39592-027, 13-00-39592-036. SAID properties shall be sold at or above a minimum bid of $250,000 (plus 10% buyer’s premium).The highest and best bidder shall be the Buyer or Buyers. Should any dispute arise between two or more bidders, the property may, at the option of the Seller, be put up for sale again. All other bids will be subject to confirmation of the seller. Bidder Verification: In order to bid at these auctions, you will be required to register at the Tranzon website, www.tranzon.com (the “Tranzon website”). All Bidders seeking to register for this auction must be eighteen (18) years of age or older, must be eligible to bid in the Auctioneer’s sole discretion based on the Auctioneer’s past experience with the registering bidder or otherwise, and are subject to verification through credit card information that must be provided in the registration process. You will be asked to provide credit card information for this purpose, and we will use a third party service or other process to verify that your credit card is valid and has available credit. When registration to bid on this auction(s) has been approved, you will receive an email notification that you have been approved for bidding. If we are unable to verify your credit card, you will have no rights to bid at this auction(s), and you registration will be deemed to be not accepted and/or terminated or extinguished without notice. In addition, bidding rights are not absolute, and all registrations, even if successfully verified by credit card as described above, are subject to manual verification at any time, and from time to time, by the Auctioneer. We may suspend or terminate your registration for this action at any time, and for any and all reasons or for no reason, in our sole discretion. We will notify you by email if your approval to bid at this auction has been terminated or suspended. Bidding Format: Once bidding has commenced, any advances on a bid must be made in increments at least as great as those which Tranzon Alderfer has determined. We also proved opportunities for a bidder to submit a maximum bid amount (often called a “max bid”) and to direct that our website bid on such bidder’s behalf in scheduled increments until the maximum amount identified by the bidder has been reached. In the event that you enter a max bid with the same maximum bid amount as was previously authorized by another bidder’s max bid, or enter a specific bid in the same amount as was previously authorized by another bidder’s max bid, the other bidder’s max bid as previously entered before your bid will be deemed to be the prevailing bid at that amount, and you will be deemed outbid. You will be emailed if someone outbids you. In the event of competitive bidding in the last 4 minutes of the auction, this auction enables an auto-extend feature at 4 minute intervals which prohibits all sniping software and activity. Notification of Winning Bidder: At the conclusion of the auction and upon bid confirmation by the Seller, the successful bidder will be notified and must immediately execute and return the Agreement of Sale to Tranzon Alderfer. Use of online contracts and electronic signatures may be required. Deposit Amount: The successful bidder will deposit 10% of the Final Purchase Price in the form of a certified check or by wire transfer to Tranzon Alderfer within 24 hours of the auction closing. This deposit will be held in the escrow account of Tranzon Alderfer. Non-Compliance: A Non-Compliance Fee of $5,000 will be charged to your registered credit card if you are the Successful High Bidder and fail to complete the Agreement of Sale and deposit the required earnest funds within 24 hours of the auction closing. This Non-Compliance Fee is charged as a penalty for failing to complete the transaction as called for in the agreed upon Terms & Conditions. Settlement Date: The Buyer will pay the balance of the Final Purchase Price on or before May 31, 2019. Possession will be transferred upon recording of the deed. Taxes will be prorated to the day of closing. Property Condition: The property is being offered for sale “AS-IS, WHERE-IS” and with all faults without warranty, expressed or implied, of any character, except for any warranties described in the Agreement of Sale. The sale is not contingent on mortgage financing, seller assistance, property inspection, radon inspection, water certification, septic inspection or termite inspection. To the extent the municipality in which the property is located requires any Certificate of Occupancy or similar certificate in connection with the conveyance of the property, it shall be Buyer’s responsibility to obtain same at its sole cost and expense, including the cost for repairs of any item required to obtain same, regardless upon which entity the law imposes such obligation. Your complete inspection of the property prior to the submission of a bid is invited. Bidder understands that he will be relying solely on bidder’s own information when bidding and that bidder has conducted sufficient due diligence to honor all bids, execute the Agreement of Sale, and close the sale if bidder is the successful bidder for the property.